What adapter i need to use 1.25" stuff in Polarex ? The Unitron adapter of which I still have a few left. There is an inexpensive in-line adapter you can get. I've ordered one but not gotten it yet. Also I've seen some adapter diagonals, but my impression is their quality is far less than your scope. 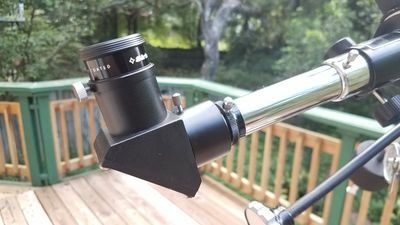 Don't give up on your .965 eyepiece set too soon. At least not till you try them. I was surprised how well the old Towa eyepieces perform in my f/13 and f/15 scopes. They were made to work together. I haven't tried 1.25 in these scopes yet (maybe tonight?) But the old ones are certainly not the junk you find nowadays.... yours should be among the best ever made, right? Yes, i am trying them for sure when i get the mount and legs, no idea are they good or bad yet ? Ok, so my adapter came in today! See the photos. It just clamps into the tube where the .965 diagonal goes. 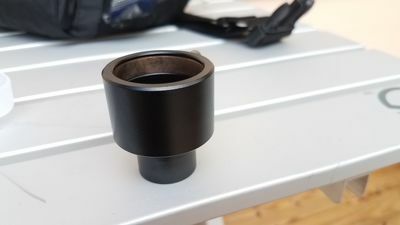 I tried several eyepieces, including an Expanse 20mm against my .965 Towa Huygens 20mm. Still daylight here so I focused on the top of a live oak tree about a block away. I had to adjust the drawtube in by maybe an inch, but it looked fine. No vingetting that I could notice. At higher power (10mm) the image was noticeably dimmer. Honestly I could not say the image was better or worse with either size eyepiece. A little better eye relief with the plossl, but I still had to get closer than usual to see the image. Maybe I'll get to try some planetary tonight. One advantage of the 1.25 eyepiece is they don't show dirt on the lens as much. The little Huygens eyepieces will show any spec of dust loud and proud. Edited by DeWayne, 26 September 2018 - 08:36 AM. Can i do new foliostrips between lenses at home, how thick they are ? one is gone and i put market folio stripe in there but dont know is it working right ? What are these numbers on Polarex box ? And now i have cradel, mount and legs well, not yet they are in starman876 home still i cant wait !!! Edited by Juha, 02 October 2018 - 03:43 AM. They are so the cabinet maker can keep track of what lid goes with the bottom. All of my boxes regardless of brand have them. That is actually a OTA that belongs to a 142 equatorial. To make it right it should be on an equatorial mount. Edited by starman876, 10 October 2018 - 06:34 AM. Look what i found near by gona pick it up tomorrow. Edited by Juha, 11 October 2018 - 02:34 PM.